Besides a Passive Solar House Design, most of us need more to maximize our comfort and efficiently. By choosing a High SEER 20+ (Seasonal Energy Efficiency Ratio) HVAC unit or units with two speeds you will have the start of a good sound and reliable system. Here are some ideas to discuss with your builder or HVAC contractor regarding your HVAC system. Properly sizing your HVAC equipmentT: Less is more, more or less? Did you know the best Air Conditioning efficiency is achieved by continuous running? It is very important that an Air Conditioner be designed to achieve the longest run times possible. An air conditioner sized to run continuously will cost less initially and will have a lower operating cost due to its longer run times. Does this sound like an oxymoron? Do what, keep the HVAC system running longer? HVAC systems are very inefficient when they first start up. It is far better for the unit to run in longer cycles than shorter ones, For example, increasing the run time from 5 minutes to 9 minutes resulted in a savings of 10% for the unit. Because of the inefficiencies associated with the start up of the unit. Under most conditions, a smaller unit will produce the same amount of cooling or heating with lower energy consumption. Two-speeds provide even, consistent temperature: It’s amazing how adding an extra speed to your HVAC system can extend the performance of an air conditioner. In fact, it’s like having two systems in your home – one for standard, everyday conditions, and a second, more powerful system for those extra-hot days of summer. A Two-Speed system operates on low speed up to 80% of the time using less energy. Low speed operation allows the system to circulate cool air throughout your home for longer periods of time, creating even, consistent temperatures in every room. When rising outdoor temperatures call for extra cooling inside, the second speed kicks in automatically to maintain your comfort. Air Ducts: Properly designed and installed air ducts will help keep the noise level down to a whisper and disperse the air more efficiently. Make sure your builder uses mastic to seal all the joints in your duct system. Don’t use “Duct Tape”!!! The “Duct Tape” that you buy at the store is good for emergency repairs on the battlefield only. After a couple of years In this arid-zone of ours the adhesive on duct tape that we all think is so strong will turn to dust, making the duct tape useless. Demand that the builder spec foil backed tape followed up with Special HVAC Mastic, which comes in a can and is brushed on to assure longevity on your duct joints. This combined technique will last the expected 30 years. There are many older homes out there that are so leaky, if the air were water you would have floated down the wash long ago. Something to have checked. Another important aspect of the duct system is to keep the ducts in the conditioned space. In other words don’t put the duct system in the attic above the insulation. Better to have ceiling drops throughout the house where the ducts can disperse with the insulation above it. You would be surprised how many houses are built the wrong way. 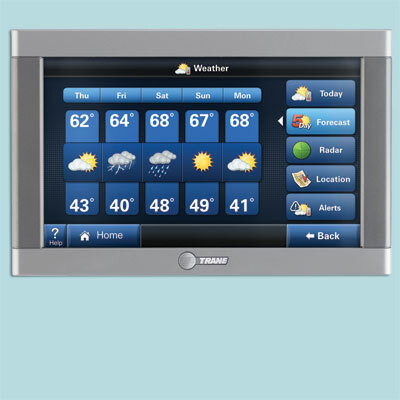 Programmable thermostat control: One half of homeowners already turn down their heat and air conditioning at night saving themselves 6 to 16 percent of there HVAC cost. A programmable or clock thermostat can automatically do this for you. In addition to lowering temperatures while you sleep, a programmable thermostat will also raise or lower temperatures again before you get out from under the covers. It not only saves energy, it’s cost-effective too. Such thermostats can be used to raise or lower the house temperature during the day or turn it off if the house is unoccupied and turning it back on before you return home. “Home Energy” magazine reports savings in excess of 20 percent. Zoning: Zoned comfort. With Trane’s innovative ComfortLink™ II Zoning System, you’ll be able to direct more heated or cooled air where it is needed-and less where it isn’t. So room by room or zone by zone, you will enjoy steady precise comfort on demand. Find a dealer to experience total comfort control. Motorized modulating dampers: Trane’s exclusive motorized modulating dampers work inside your ductwork by opening and closing in partial increments so you can fine-tune zoned areas for maximum comfort. Smart control of your comfort: Most homes don’t get the same amount of sun or shade all day, so why would you expect to need the same type of cooling or heating all day? 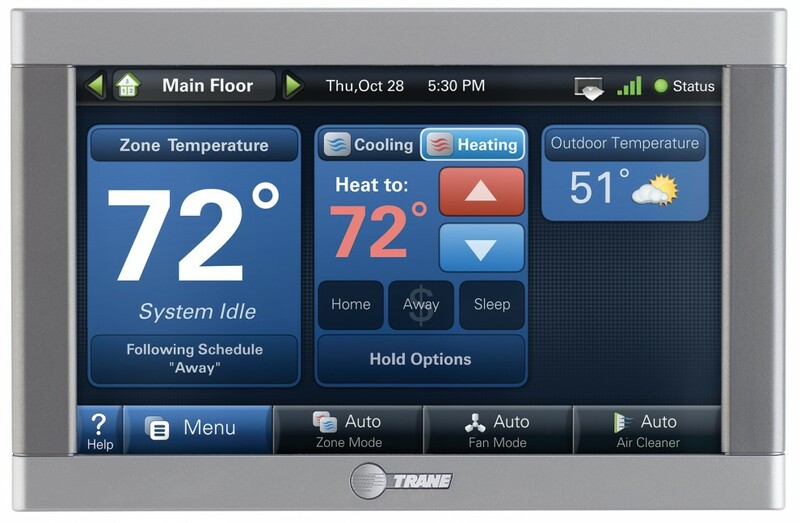 With Trane’s ComfortLink™ II Zoning system, you’ll be able to set a schedule on your thermostat based on your home’s unique temperature patterns and control it all from wherever life takes you with Nexia™ Home Intelligence. Every ComfortLink II Control comes with remote “climate access”, allowing you to monitor and control your zoning system through any web-enabled device.